Karakol town, Kyrgyzstan, Issyk-Kul region. 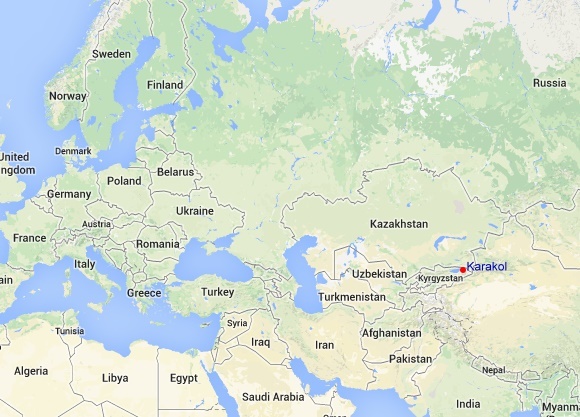 Welcome to the site where you can find all information about Karakol. Karakol is the small lovely town in the eastern part of Issyk-Kul region of Kyrgyz Republic (Kyrgyzstan). This mountaineous area around Karakol is very attractive for tourists of any kind: mountain climbing expeditions, horse-riding tours, hikings and trekkings, heli and mountain skiing. In addition to that Issyk-Kul Lake (which is proudly called the Pearl of Tien-Shan) offers the sandy beaches, resorts, spas, hot springs and great opportunity to sunburn in the summer time. The usual way to get to this wonderful area is to arrive to the capital of Kyrgyzstan, Bishkek city. International airport "Manas" (FRU) takes a lot of flights from many countries. Regular flights from Almaty, Istambul, Moscow, Shanghai, Dubai are landing daily. On arrival to Bishkek or Almaty (Kazakhstan) you should take a taxi or order transfer to Karakol and have a stunning journey over the Boom pass and along the 180km lake shore. The choise is very large: from economy rooms to luxury apartments, from single to four bed rooms. Breakfast is usually included to the price. Cafe, bar, conference hall is for additional booking in Karakol hotels. Guest House in Karakol it's a private house with 3-6 rooms usually offered for booking as per room or as full house for one group. The owners of the house are usually cooking local national food for guests and breakfasts are also included to the price. Saunas (banya), pool, and a few other services offered additionaly in many of the guesthouses. There are many variants of flat rental in Karakol town. This way of living in this area is very popular with small groups of students, mountain skiers, families. Kitchen is equipped with all neccessary for cooking and no meal included to the price. If you are in Karakol and searching for the mountain guide, or trying to find the best route for a few days trekking in surrounding mountains we can help you with this choise. We have the professional area and mountains guides, drivers, interpreters who can help you while you are in Kyrgyzstan. We are the team of local professionals providing services for tourists: licensed drivers and comfortable cars, mountain guides, interpreters and porters, accommodation in guesthouses, hotels, flats and hostels, horseback rides and paragliding. "Me and my family discovered Karakol in winter 2014. We want to say a huge Thankyou to owners of "Velyur" guesthouse in Karakol. Great meal, sauna (banya), clean rooms, friendly service..."